Shingles is an acute and painful inflammatory virus disease affecting the skin overlying one or more sensory nerve trunks. The virus that causes shingles is the same kind of virus as causes chickenpox (varicella). 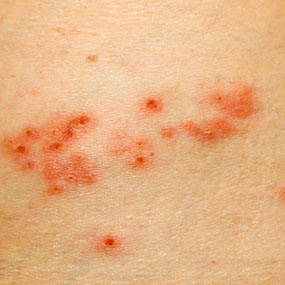 The skin eruption of shingles is characterized by groups of small blisters on inflammed red skin areas. The skin eruption breaks out in crops, each succeeding crop tending to locate nearer the end of the related nerve trunk than did the preceding crop. The groups of blisters, each with a red base, dry and form crusts after a week or two. When the crusts fall off, scars are sometimes left. The blisters sometimes become pustules before drying. At stage, where crust has been developed, the individual is no more contagious or infectious. Though, shingles is contagious to some extent at early stages but it is less contagious than chickenpox and chances of spreading disease can be minimize by covering the affected areas.Wash your hands often to prevent the spread of varicella zoster virus. In severe cases they may tum into small spots of gangrene. The pain, neuralgic in character, may develop before the blisters appear; and it may persist for weeks, months, or years after all signs of the eruption are gone. This is especially true of elderly people, and outstandingly so when the forehead and face are involved. The nerves which supply the skin of the chest are most likely to be affected. The eruption in atypical attack of shingles appears on one side of the chest, spreading from near the spinal column around almost to the breast bone. Nerves on both sides of the body, or more than one nerve on the same side, may be affected, with correspondingly widespread eruption. Occasionally nerves that supply the skin of the neck, arms, abdomen, or thighs are attacked; but second in frequency to the chest, shingles tends to appear On one side of the forehead and face, following the course of the supra orbital branch of the trigeminal nerve. The usual course of the disease is four to six weeks. It is usually less severe in young persons than in old.Overwork, general debility, damp and chilly weather, or the absorption of certain drugs, particularly certain compounds of arsenic, or contact with a case of chicken pox, favor development of the disease. The specific cause, however, is a virus which affects both the nerve roots and the skin over them. One attack of shingles gives a high degree of immunity. Second attacks are rare. to fourteen days while the discomfort is severe. 2. An electric heating pad applied to the painful area or areas will relieve some of the discomfort. 4. Do not open the blisters that appear on the skin. If the skin breaks, the use of Bacitracin topical ointment will help to prevent the development of infection. 5. It is best to consult a physician in all cases of shingles, but especially in sever cases. Pain may be so severe that home treatments will not give relief. 6. In persons above 60 years of age who have shingles, there is the possibility that the pain will persist for long periods of time. This possibility is reduced by the administration (under a physician's supervision) of corticosteroid medication during the acute phase of the illness.